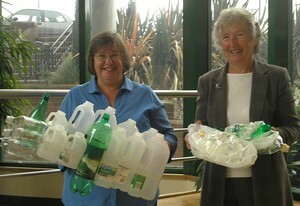 Peter's wife, Pam and a local councillor show the difference between squashed and non-squashed bottles! I know we are extremely lucky here at Chez Green. We live in a mansion with a North and South wing. Ok, we don’t, but we have a kind of outhouse thingie where we can store all of our recycling. Inspired by this wonderful photo Peter sent me of his lovely wife and councillor friend showing the difference between non compacted and squashed plastic bottles; and having been to a mobile home for a week by the sea, I now know, first hand, some of the challenges faced by people with storing recyclable materials in a small space. Some of our readers live in flats with no outside storage, or have small kitchens without much room for a fruit bowl, let alone some old smelly plastic bottles. Others of you live in a shoe with so many kids you don’t know what to do whilst we have some students with just a handful of possessions to their name (and a bokashi and a compacting machine probably aren’t on the list). I’ve been thinking about some of the things we automatically do when dealing with our recyclables here and when you think about it – the biggest component of empty recyclables is air. So the best thing to do is remove as much of that air as possible to increase your storage. For most items you’ll be able to store 3-4 times more stuff if you compact it properly. None of these ideas are new, but they might just get you thinking about new ways to deal with storage; especially if you are new to the recycling game. I would LOVE to hear what happens in your home. Can crushers are a great way to get children involved in recycling and it helps them remove some pent up energy and put it towards something useful! The most important thing I’ve found with this is to keep your piles tidy! I know it sounds trite, but if the container is big enough for the papers to lie flat, you can get loads more in there. Even though genius writers in the movies rip paper from their typewriters and toss it into the bin, keep your sheets flat for maximum storage. If you’re getting rid of personal papers, then shred it and add to the compost heap or wormery. It also lights surprisingly well in a fire once shredded. There is not alot you can do to reduce the amount of space needed to store glass as broken glass cannot be put out for kerbside collection and it’s dangerous anyway. The only thing you might be able to do is store a beer bottle inside a jam jar to utilise space. Spot the difference! Some tetra pak cartons, such as ones used for soya milk squash even flatter! The advice from tetra pak is to wash and squash. They tell us that this helps us all to get three times the amount of cartons into the bins and collection vehicles. Whatsmore; if you come up with an entertaining or crazy way to flatten yours, you could win some prizes in their ‘How do you squash yours?’ competition. The tall cartons, such as the one for juice in the photo can be squashed by pushing in the sides. For the more rectangular ones, such as those used for milk, I pull out all the tabs and it folds completely flat – like a cardboard box. It goes without saying that cardboard boxes take up a fraction of the volume when they are flattened than when complete. All boxes from cereal to washing powder to banana boxes can be pulled apart and flattened into a few layers of cardboard. Prop them up against one another in another cardboard box and they’ll retain their shape. If your storing polythene such as carrier bags, toilet roll and kitchen roll wrapping and magazine wrapping then again, keep them flat. In my time I’ve had a ‘bag of bags’ which you can hear rustling as they unfold themselves. They’ve been stuffed in there and I’ve had to close the cupboard door and run – you know what I’m talking about, right? If yours are overflowing make a note to take them to the supermarket for recycling next time you go and after that; take a few moments to anally fold your ploythene before storing. I know it’s a pain, but it’s less stressful in the long run! Put something heavy on it to keep it flat otherwise it will be dancing around the room. Squashed foil balls weighing over 1.5kgs in total! Foil is easy to store. it folds really flat and retains its shape. Infact, that is how you know the difference between recyclable and non recyclable foil. If it springs back out of shape (like a crisp bag), it is composite material which cannot be recycled. If it behaves itself and stays in the flattened shape then it’s recyclale. Another way, favoured by some of our readers is to squash it into a ball. Great work to keep little fingers busy as long as the foil isn’t too sharp. Take a look at what Carole’s classes at school achieved with their foil recycling with our ‘Carole’s got balls‘ post. As shown in the top photo from Pam and her friend, it saves heaps of room if you squash bottles and put the lid back on. Think of it as a free workout for your pecs without the gym fees. Plus there is something delightful about the sound of a crushing bottle after a stressful day. How do you store recyclable materials in your home? How do you compact things to maximise on space? – you can put glass jars upside down on the necks of bottles to save space in your glass collection box. But I rarely recycle jars now as if I save them with their lids, someone always wants them on Freecycle for jam etc. I usually get a shoebox full and then offer them, so they don’t take too much space – and someone comes to collect them! Wine bottles with screw caps are also sometimes in demand, as are beer bottles with the wired stoppers (Grolsch etc.). What I would really like to do is clean out the “bin cupboard” by the front door (designed pre-wheelies – it’s up 2 steps and too small!) and put in some stacking boxes for the things that don’t get collected: tetras, foil, other metals, polythene. The recycling bin lives just next to it so we don’t need to store plastic bottles, paper/card or cans, they go right in. And I just need to remember to take glass to the box in the garage when I get my bike out each day! @Katy: Whereabouts are you Kate? Our council take the plastic bottles with caps, so Mrs G’s methodology, works just fine. I collect polythene in the scrunch and run fashion, but every now and then I put it all into a bag that I can tie-up with as much air expelled as possible. Glass jars go to a friendly jam and chutney maker. If I have a small jar, it can often be stored inside a larger one until I persuade DH to drop them off on his way past said friend. Papers are mostly stored as Mrs G’s and our cardboard (a recent addition to kerbside collections), is flattened and stored in a larger box. Foil is put into a foil dish until another dish becomes available and then squashed up together. Tetra packs and tin cans all flattened and squashed. Norwich. “Plastic bottles, rinsed out and lids removed” according to the official info. Mrs G also had lids on clarified locally, but I can’t find the relevant postings. @Katy: Now that sounds like a great anger management technique you have there, Katy LOL! I’ll have to try it and see if I can ‘convince’ plastic bottles to stay squashed. @Poppy: How great to have kerbside collections for cardboard; that must be a real godsend. I like hearing how other people store all their stuff as I know it must be a real problem for some people. Here’s the link to all the info about plastic bottle lids; thanks for remembering! Squashing to free the air (or reduce the volume). An excellent example which could be used in schools as it seems to passed many people by. I missed this last year and found it looking for recycling at work. I feel great shame Mrs G. Where my Mum lives they have moved onto co-mingled recycling and they take the dreaded plastic tubs and containers! As I was visiting, I gleefully packed up all my plastics and took them along with us. Better some recycling than none I thought. The large blue wheelie bin was about half full, but as they are going away on a prolonged break this coming week, a few more wasn’t seen as a problem, so I stacked them in tidily and walked away with mixed feelings about the rights and wrongs of co-mingled. We had another unexpected visit there today and I took the small bag that had accumulated over the week. I opened the bin and was mortified to see that they make no effort at all to reduce the amount of waste that they are putting in or the space that it fills, 2 litre unsquashed bottles, 1 litre tetra pacs, papers chucked in here and there. I realise that this is a totally different process to the one we’re used to and that what they’ve done is perfectly acceptable for this process, but it so went against everything I’ve been doing for the last couple of years. I wanted to grab the bottle out and stamp it flat and pull the ears up on the tetra pac to flatten it and if I’d been there on my own, I probably would have done! As I said re the holiday waste – I think I need help! With this kind of recycling you get gardens and streets ‘peopled’ with bins don’t you? There is no incentive to reduce. It is so sad to see gardens taken over with these enormous bins. They are big enough to swallow people. I guess it is a control thing but I like to be bigger than my bin! Luckily I notice that some LAs seem to give a choice of size. Flexibility is important as people and properties are different..
« Is cornstarch plastic packaging (PLA) compostable or recyclable?